Recently I found myself in need of a roommate and, like many others, reached out to the Craigslist universe. Looking back at the post titled ‘Super Awesome Roommate Needed’, it included more details about the extroverted and energetic roommate (me) than it did about the actual place they would be renting. I had a few takers, but no one that I was interested to live with. A few weeks later I received a rather substantial email from someone who had found my full name from the land records, googled me, and even contacted a mutual friend to investigate the match. In his email he explained his “research process” and why he thought we would be awesome roommates and drove the point home by explaining his love for Doctor Who – an addiction we shared. Most people would think this was creepy, but I loved it … because it was exactly what I would have done. We met for coffee and hit it off immediately. I didn’t know this until months later, but he was joking with his friends that “Brian decided I was moving in before I had decided I was moving in.” About a week later he did indeed become my new roommate. 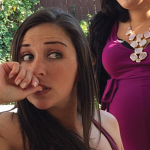 He looked mortified – and rightfully so. And thus I conceived the most elaborate and manipulative prank of my life (so far). It began innocently enough with me snagging the email address he had listed on his Facebook profile, adding it into an Excel worksheet, and exporting it as a .CSV file. 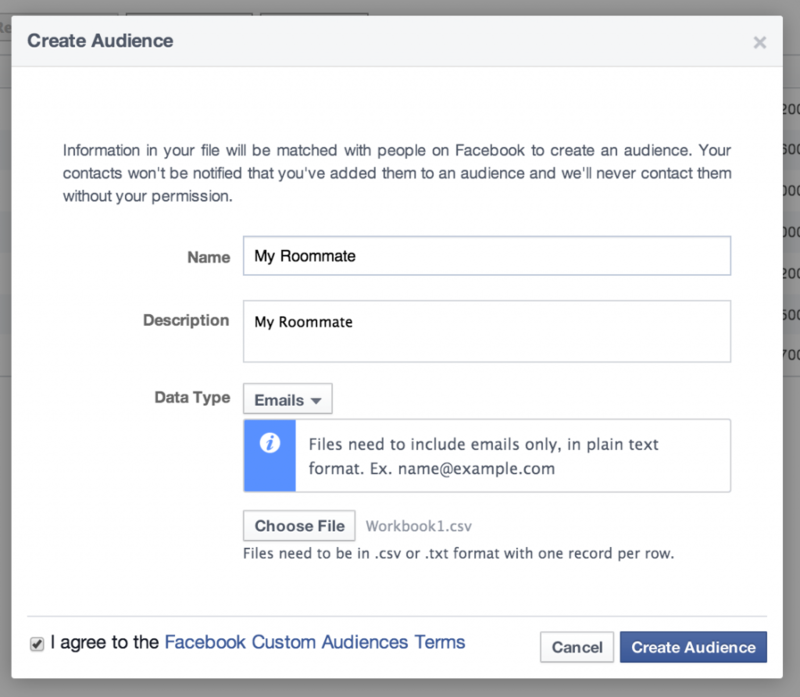 I then used the Audiences tool in Power Editor to upload the file to Facebook as a Custom Audience labeled ‘My Roommate’ as you can see below. You can do this with anyone’s email address or, if you don’t have that, you can very easily find their Facebook User ID using FindMyFacebookID and use that. The wonderful, and devious, thing about this is that it doesn’t matter if their profile is public or private – so long as it’s searchable, you can get the UID. Again, just add it to an Excel worksheet, save it as a .CSV, select ‘UID’ for the Data Type and upload it as a Custom Audience. EDIT: Facebook has since changed their policies and won’t allow you to market to any audience with less than 20 people. If you want to try this yourself, there’s a loophole. Let’s say you want to target one of your guy friends, add his email to a .CSV along with the emails of 19 female friends before uploading it to Facebook. You can then target anyone in that custom audience who is also male (thus eliminating the 19 women and effectively targeting a single person). Again using Facebook’s Power Editor I created a campaign (of course labeled ‘Payback’) and started with a few blank ads. 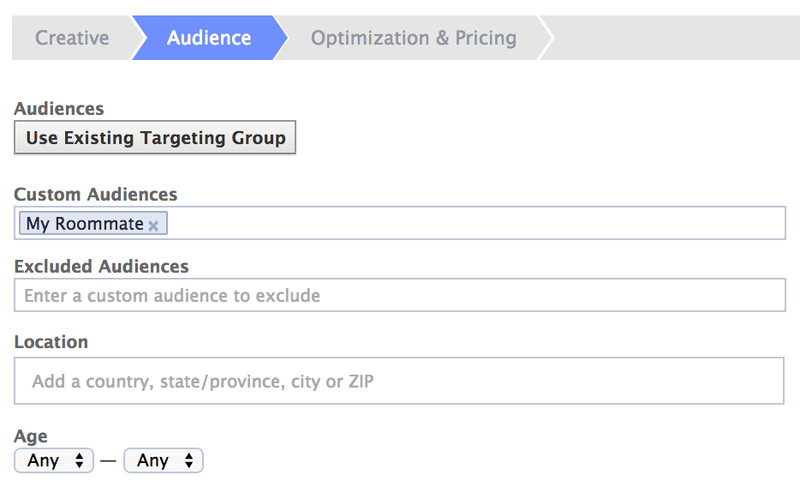 Under the ‘Audience’ tab I selected the ‘My Roommate’ Custom Audience I just created as my only targeting and Facebook said that my Potential Audience was fewer than 1,000 people. At this point my plan was clever, but what I did next made it just plain evil. It’s been proven time and time again that Facebook knows more about you than you know about you. While advertisers are able to use that data in their targeting, it’s often poorly executed (which is why I, a Jew-ish guy, often see ads for Christian dating sites), but as a Facebook user you’re never able to see WHY you’re being targeted. This was exactly what I planned to use to exact my revenge. I was going to target him with highly personalized messages that were focused on things Facebook truly shouldn’t know about his personal life – things that weren’t even online, let alone on Facebook. 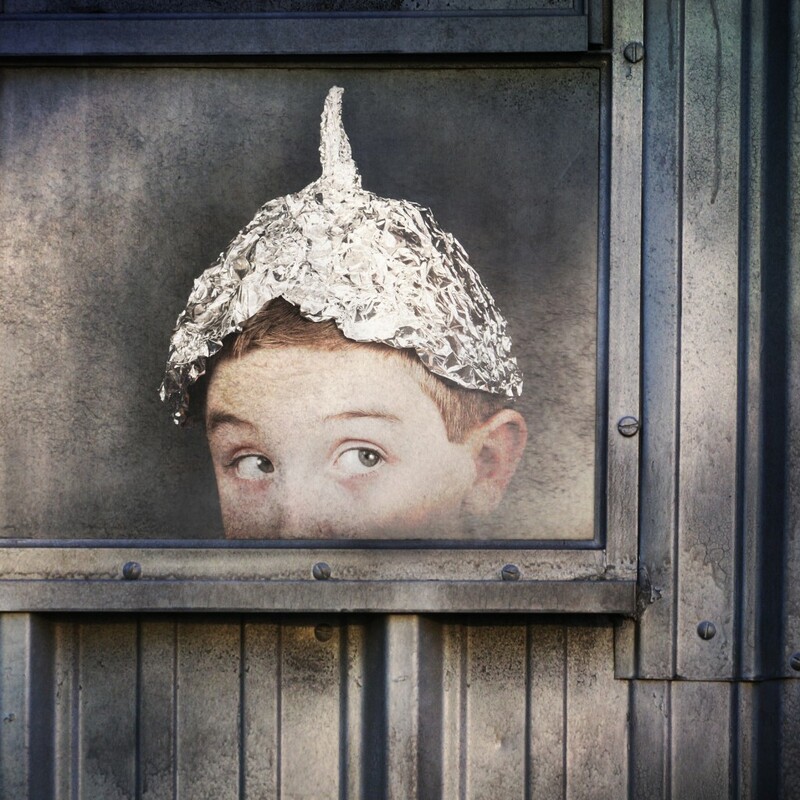 The goal, to make him unbelievably paranoid. 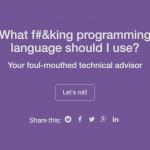 Since I didn’t want him to know that I was placing the ads I opted to use sidebar ads and direct him to sites that somewhat related to the message – although most of the links associated were pretty random. 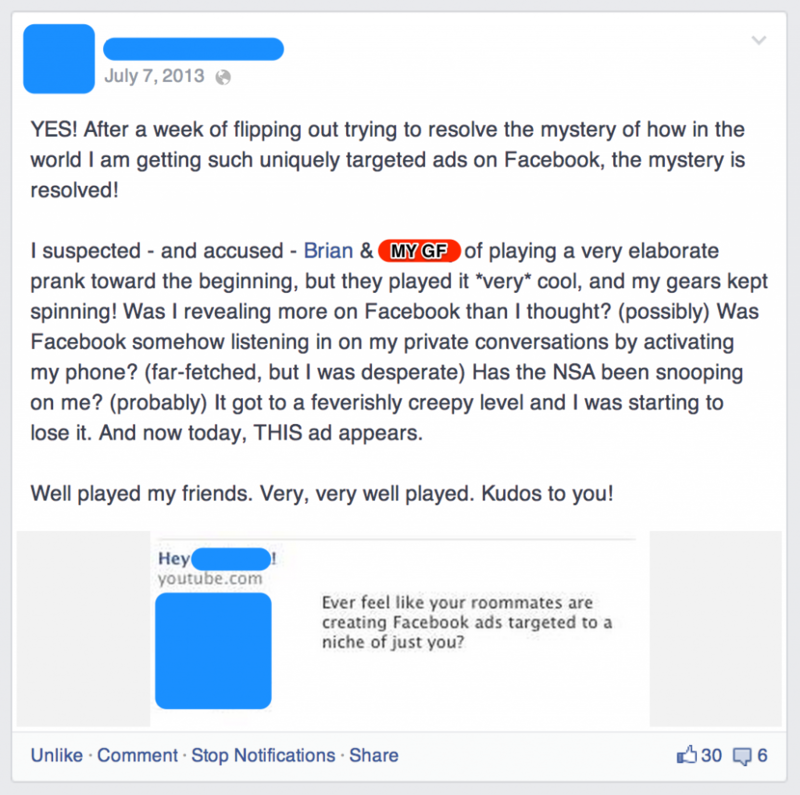 This enabled me to target him with ads anonymously whereas if I had done newsfeed ads I would have needed to create and populate a fake Facebook page to maintain the illusion (let’s be honest, I may not do things half-assed, but I still do them efficiently). It should be mentioned at this point that my roommate is a professional sword swallower. Seriously though, he’s a professional sword swallower and quite an amazing performer. He’s also extremely talented at utilizing applied psychology to read body language and people as a part of his shows. I don’t know much about that stuff, but I know enough about getting in someone’s head to be slightly evil – only when warranted of course. Seeing as I had lived with the guy for a few months now, I knew enough about his personal life that I was able to create some rather terrifying ad placements. 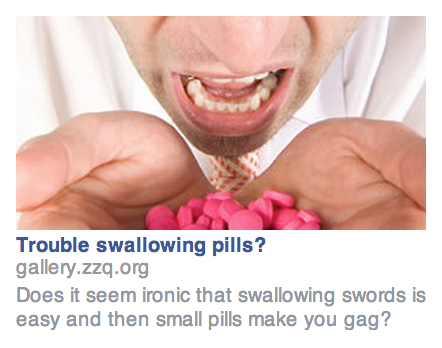 While my roommate is a professional sword swallower who can down a 26” sword to the hilt, he gags every time he tries to swallow a pill – oh the irony. While he didn’t broadcast it publicly, it was the source of a great amusement to those close to him that knew it – especially me who saw him attempt to take vitamins every morning. For this placement the idea was to sell a fake product that helped people take pills without gagging … and have it speak only to sword swallowers. At this point I was LITERALLY rolling on the floor laughing. I’m pretty sure I peed a little picturing him vigorously refreshing his Facebook page. At this point I was laughing so hard that I literally couldn’t breathe. This was only the beginning, so I of course played into it to further his paranoia. I had also paused that ad variant (leaving several others active in the campaign) so he would constantly be on the lookout, but never see, that specific message in his sidebar again. The goal of pausing the ads once he had seen them was to (without any proof to show to his friends) leave him thinking he was just a little bit crazy and thus amplify his paranoia. At this point, I had him concerned with the unnerving accuracy that Facebook had predicted his personal life and of course wanted to step up my game. 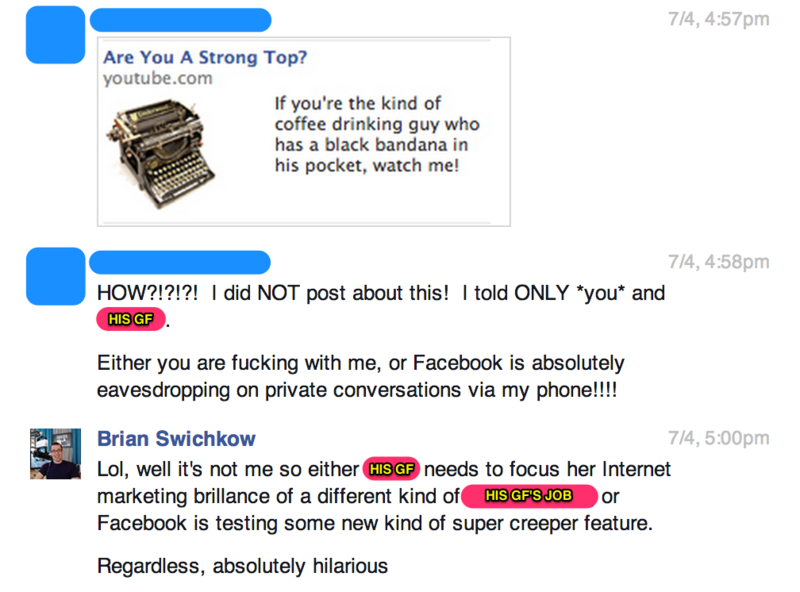 I decided to build on that and (somewhat) subtly illustrate to my roommate that Facebook knew something about him that he didn’t know about himself. The actual image used in the ad is blurred out below as I’m sure you would agree that your imagination for what was being suggested is sufficient. It was truly luck that he never discovered any of these ads while he and I were in the same room because my maniacal laughter would have been a dead giveaway. Over the next two weeks I continued to create and target ads that had a progressively more accurate and disturbing understanding of his personal life. Long ago I had discovered that “cold marketing” campaigns (when you’re marketing to an audience that doesn’t already know you) are most effective when your targeting is specific and your creative is general. With this knowledge, I was never direct and always ‘fired shots across the bow’ so that he wouldn’t feel targeted – even though he was being targeted (this is by far the best way to market to a small audience). I wanted it to appear that he was finding the ads and not that the ads were finding him. This gag went along without a hitch for just over two weeks until I got a bit carried away and made a mistake. 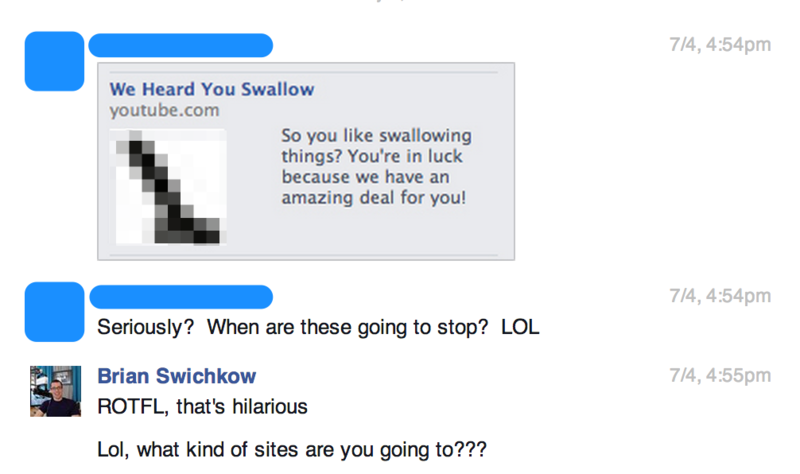 I targeted him with an ad that referenced an inside joke and didn’t realize how inside of a joke it actually was. He ended up posting this same snapshot on his Facebook page with the comment, “I think Brian is behind this…” and a fair number of his friends chimed in to help solve the mystery. At this point I was on the defensive, I needed to refute my involvement in this dastardly plan so that I could continue torturing him. I posted, “I’m flattered to know that you think I’m capable of something like that, but it’s not me! That’s too crazy!” The conversation continued and my denial resulted in a bit of a miscommunication that worked to my advantage. He thought I was pissed that he had accused me, ended up deleting the post, and dropped the conversation. I knew that if he saw more ads the jig would be up so I paused the campaign and figured I would wait a bit for suspicions to cool down before resuming the torture. I was pretty busy at the time and ended up forgetting about it entirely. I unknowingly experienced one of happiest coincidences of my life. As I said before, my roommate is extremely smart – so smart in fact that when he was unable to afford a computer at the age of fifteen he taught himself computer programming on paper. It was nothing but a blissfully happy coincidence that this prank intersected with the (already horrifying) Edward Snowden controversy. Having the Snowden controversy in the news every twenty minutes only amplified my roommate’s paranoia that someone, somewhere, was watching his every move. It was about a week later when I called him to ask something rather innocent to which he replied, “let’s talk when I get home, not over the phone.” The request seemed a bit off considering his normal behavior and was certainly cause for raising an eyebrow. About fifteen minutes later, when he arrived home, I turned around in my chair to greet him. His shoulders were hunched forward as he went to hang his keys on the hook and when I said “hey there” he nearly jumped out of his shoes. It was at that exact moment that I realized I had never told him who was responsible for the ads he had seen. There’s something to be said about the power of uncertainty and how it attaches itself to our deepest fears. Every day he was left without an answer was another day his paranoia amplified. It was like I had cast him in a horror movie where killer never reveals himself and the suspenseful music just keeps endlessly looping. I was afraid that if I didn’t end the torture he might need psychiatric treatment. It had been three weeks since this prank began and the goal of torturing him had most certainly been achieved. I was ready to reveal the ‘man behind the curtain’ but needed to do it as dramatically as the prank itself … so I created another ad. This time the headline of the ad read “Hey (His Name)!”, used his profile photo as the image, and asked a rather provocative question. In revealing this to him, part of me was absolutely horrified. I knew that if there was retaliation it was likely to be catastrophic. Like I said before, while I’m pretty clever – he’s rather brilliant. There was a fair chance I was going to regret this for the rest of my life. About two days later I got a notification that he had tagged me in a Facebook post. The next morning I woke up to a note on the whiteboard in our kitchen that read, “VERY VERY VERY WELL PLAYED.” It would appear, for now, that he has surrendered to my deviousness and isn’t planning to retaliate – but then again he could just do nothing and have me looking over my shoulder for the rest of my life. Regardless, I’m sure I have more points on the board. I had effectively driven my roommate to a state of paranoia with Facebook ads and the entire three week long marketing campaign cost me exactly $1.70. It was worth every… single… penny. EDIT: Originally shared in /r/marketing, this article (the first to be published on this website) attracted more than 450K readers in 72 hours and 5M media impressions in 30 days. 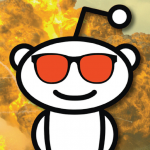 It catalyzed notoriety as a “reddit marketing expert” and Forbes credited me with creating the “magic formula for going viral”. Finding the time to follow my passions for experimentation and storytelling had became the fulcrum to my career; teaching others to do the same (faster than the decade it took me) has become my new passion.